Heinrich Kemler, the Lichemaster, is the most iconic villain from the golden age of Warhammer Fantasy Battle. 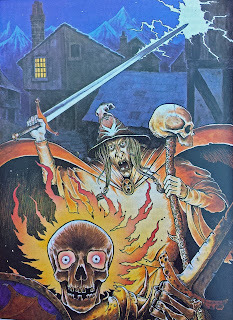 He was invented by Rick Priestly for Terror of the Lichemaster (1986), a boxed scenario pack that included a campaign book, counters and 15 cardboard buildings. The three sequential scenarios in Terror of the Lichemaster were extended by a fourth scenario called The Vengeance of the Lichemaster which appeared in the Spring 1986 Citadel Journal. 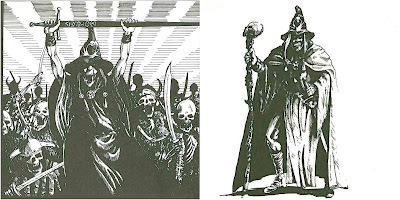 Finally, Priestly and Carl Sargent resurrected the Lichemaster in Return of the Lichemaster (1989) a mini-campaign for Warhammer Fantasy Roleplay that revised and reconfigured the events of Terror. 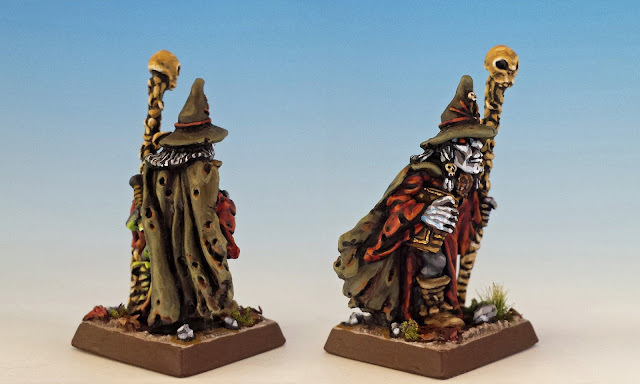 So welcome to the first of several posts unearthing a complete painted set of the miniatures from the Terror of the Lichemaster. Kemler has been an obsession of mine for years. But I'm not the only one who found him stalking me in my dreams. From the very beginning, the Lichemaster had a grip on the imagination of the Games Workshop studio. 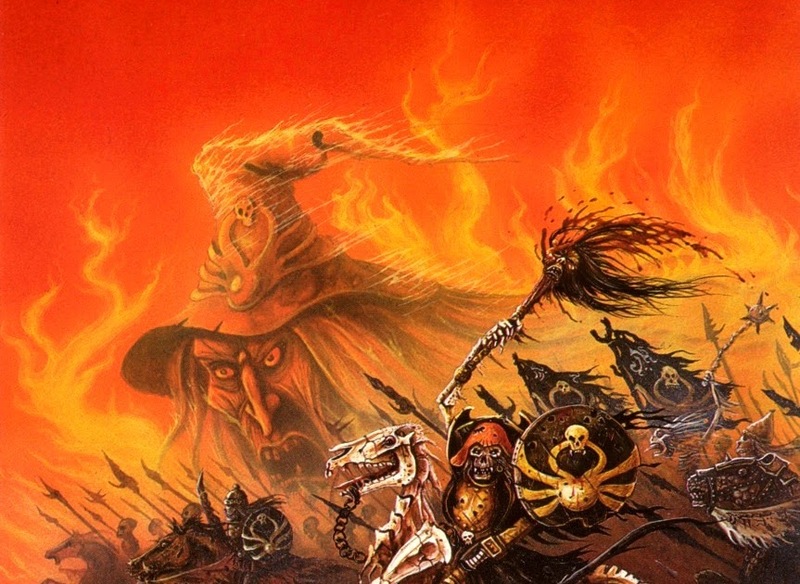 No other Warhammer character was portrayed so often or by so many different artists. 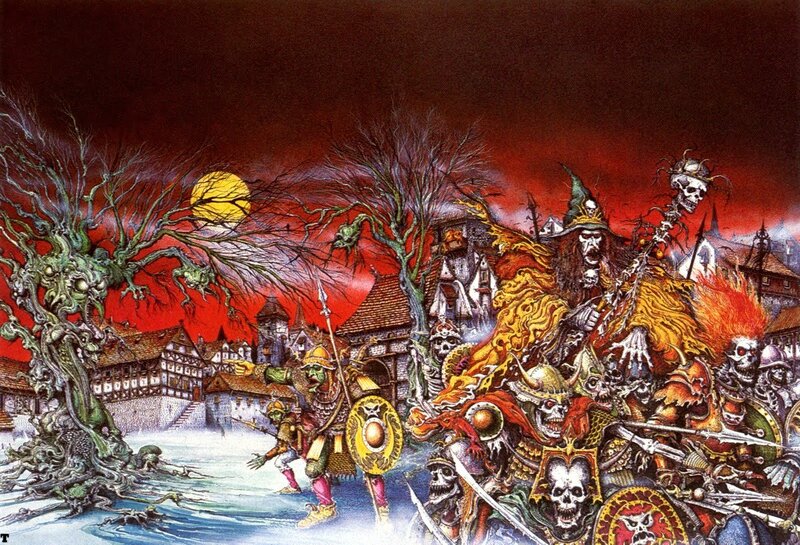 John Blanche, Tony Ackland, Gary Chalk, Ian Miller and Dave Andrews all tried their hand at illustrating Kemler. So who is the Lichemaster? According to Terror of the Lichemaster, he was a "necromancer and man of power" who studied magic in the great cities of the Empire. However, a life of dark magic ravaged his body until his enemies (witch-hunters? rival warlocks?) saw their chance and began hounding him from city to city. At the very end of his strength and with his pursuers closing in, Kemler washed up in the remote Frugelhorn Valley in the Black Mountains. There he discovered the burial mound of a long-dead Chaos Warrior named Lord Krell. Kemler reanimated Krell and his undead soldiers but the rite sapped what little life was left in the necromancer. At the edge of death, Krell offered Kemler a hellish pact: assist Krell in leading his skeletal horde, and in return receive the power to extend his life by killing others. The Terror of the Lichemaster then follows Kemler's attempt to slay the inhabitants of the Valley, culminating in an attack on the village of Frugelhofen. Even Heinrich Kemler's name conjures up some fascinating associations. 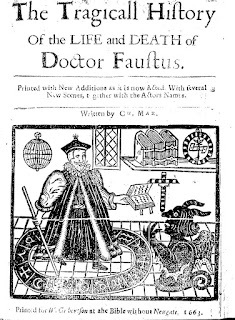 His first name evokes Heinrich Cornelius Agrippa (1486-1535), the German occultist who traveled across Europe and frequently found himself accused of heresy. His name also closely resembles Heinrich Kramer, the author of the 15th century witch hunting manual, the Malleus Maleficarum. 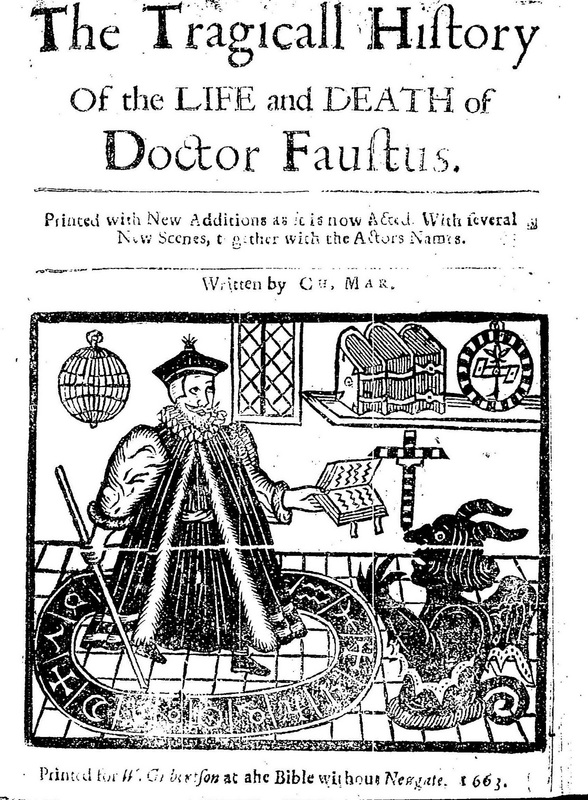 But the clearest influence on the Lichemaster is the legend of Dr. Faustus (circa 1480 - 1541), a scholar who allegedly bargained his soul to a demon for great magic powers. In other words, Kemler highlights the close connection between the Warhammer world and the German Renaissance, where secular learning opened up a new world of scholarly inquiry that would often challenge the accepted morality of the Church. I think we also have to say something about his title, "Lichemaster". Dungeons and Dragons popularized the notion of a Lich as an evil wizard who uses powerful spells to animate his own body after death. 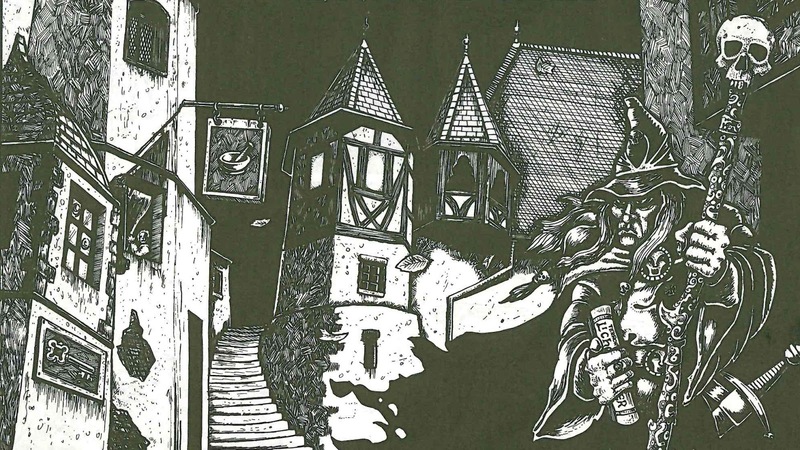 But in doing so, Gary Gygax and co. greatly extended the meaning of the word lich, which originally meant merely a body or a corpse (hence Lichgate means the covered entryway to a churchyard and a Lich-house is a mortuary). For this reason, Lichemaster is a better term for Kemler -- his is a Master of Corpses. (It is delightfully unclear whether Kemler is himself a corpse now or merely suspended on the edge of death). Although the Lichemaster might be an iconic Warhammer villain, his is a hell of a rare miniature (it seems that he was only available by special mail order to Games Workshop during the mid-1980's). This is one of the reasons I became obsessed with him -- I just couldn't find him! When I finally stumbled upon him on eBay a few years ago, I paid too much but never regretted my lightening fast "Buy It Now". He is a beautiful miniature (the work of Aly Morrison if I'm not mistaken). But his rarity and cost made me scared to paint him -- it took me a few years to build up the courage. Terror of the Lichemaster indeed! Wow, you certainly left the terror of the lichemaster behind and faced the challenge. Outstanding result; I didn't know of this mini, but I really like it, it's one of these cases in which the mere sculpt tells a story, and your paintjob does its part on it! Thanks Suber! It is an evocative miniature, isn't it. I love the way he is gripping his tome, like his life depends upon it. I also like the fact that he has a little smirk. It's creepy. Excellent painting. Colour pallet is spot on, and great history as well. Heinrich Kramer and the Malleus Maleficarum being a keenly made observation. I do wonder whether you left out the names association with Heinrich Himmler, who has something of a reputation as the Nazi Occultist par-excellance. Now that I see the black glowing rune-sword, red eyes and pale skin, I can't help but think a certain infamous Melnibonéan albino sorcerer might have been thrown into the mix. By the way, the image by Gary Chalk was the original release box cover artwork (1986), and the Ian Miller piece was the 1987 re-issue cover, painted side-by side with art for Blood on the Streets. I know, I should get out more. Great call on Himmler, Zhu. There are many layers on evil in the Lichemaster. And thanks for the observations about the art. I've edited the post to reflect your insight. Please don't get out more. Absolutely phenomenal entry! A piece of Warhammer history in they're most fantastic and climate times. Thank You! Thanks Michal! 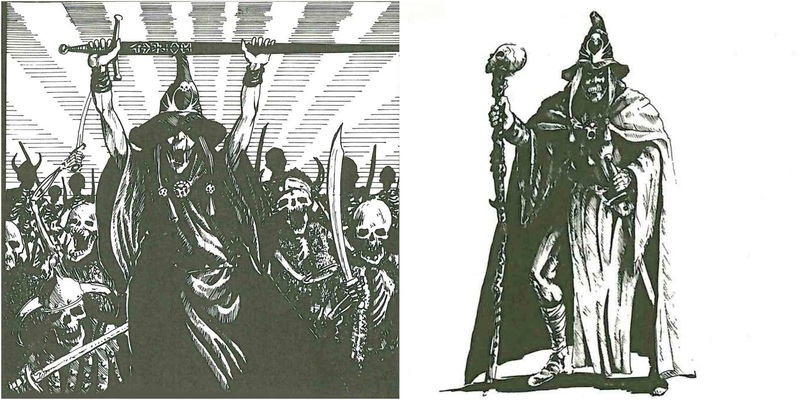 The Lichemaster certainly is a part of Warhammer history. That's a nice way to put it. I'm glad you enjoyed, Phil! Matt outstanding post, one of my favorite characters from the Warhammer World! The boxed set is great. I am envious that you have a complete set of the original mins. You can’t get any better satire wise when you have a flaming headed skeleton named Mikael Jacsen, that is just all sorts of wrong! 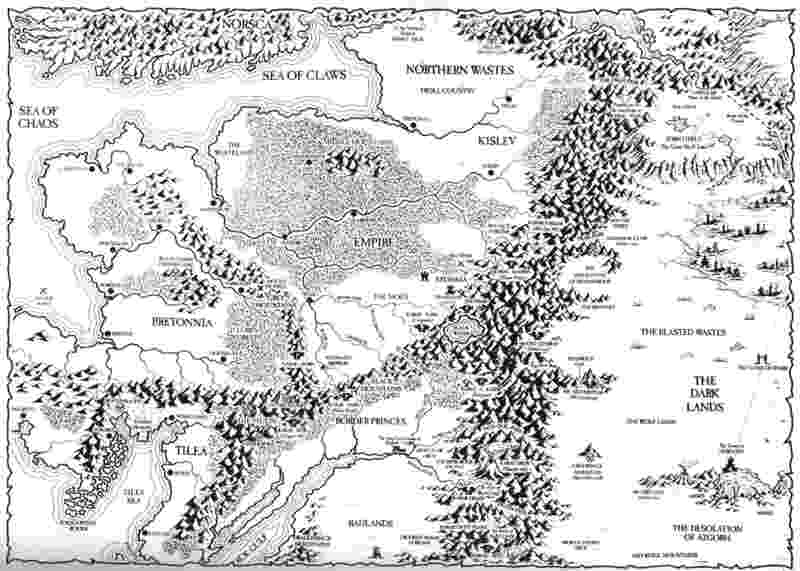 Do you have the pin that came in the boxed set? No don’t tell me I’ll just get jealous. And in return for your post I added on myself for the one eyed lovelies from the bog, not nearly as good as this one. I managed to find a nice boxed set on eBay with nearly mint contents, but not the pin or badge or whatever it is. Thanks for the shout-out on your website! Glad you liked Heinrich. I'm ashamed- I only heard of the Lichemaster when he came out for Warhammer in the mid 90s. I didn't know he had history! Oh great! Now I'm even more scared to paint my own. You've done him justice, really nice. Part of my hesitation is the urge to follow millers colour scheme and your paint job makes the indecision even worse. I spent a long, long time agonizing about colours. As is so often the case, I was divided between my natural inclination to paint Heinrich in darker and more realistic tones, versus being ambitious and going for something colourful and eye-grabbing. Inspired by Miller's painting, I went for a compromise, where your eye is drawn to his pale white face. But I couldn't bring myself to go full Miller and give him cherry red hair. I was afraid it would make him look like Ronald McDonald. Amazing paint job Matt! Looking forward to watching this project. Thanks ABG! I'm happy to finally be bringing this project to light! Zhu made the same point about Himmler and I totally agree. It adds an even more sinister dimension to Kemler. Great update and beautiful painting. I really like the sinister shadows & depth on his face. Wasn't there one more return of Kemmler, vs. later edition wood elves? 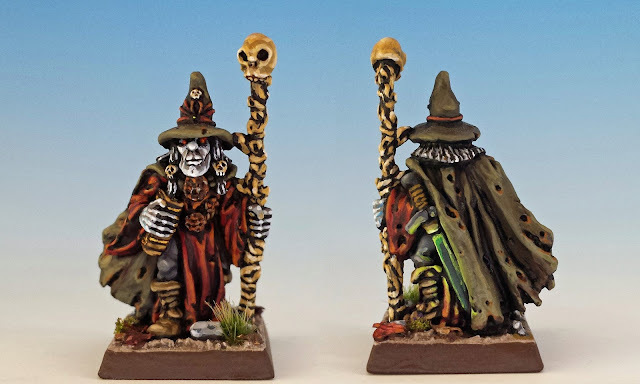 I have never collected the original figures, nor played any of the scenarios/campaigns, (I can only dream...) but I've always felt the collected Lichemaster stuff is some of the best work created for WFB. That's right - there was something about the Kemmler (now spelled with 2 "m"s) later in the 1990's. They produced a new miniature for him, which was hideously ugly in my view: over-sized hat and staff, plus a stiff pose, like a scarecrow. Very informative post Matthew. I had assumed the his name was a reworking of Hienrich Himmler, but there now appears that there were quite a few other likely candidates. Glad you like the post, the one. The scenario packs were just a little bit before my time, back in the 1980's. I first got into WHFB when the Orange Book came out in 1987. But when I reconnected with Warhammer about 10 years ago (now Oldhammer, I guess) I was immediately drawn to the coolness of the scenario packs. amazing work on that very old named character, a good look at his history gaming wise as well, well done indeed. Thank you DR. It's a lot of fun to dig into that history. Yarrghh! What a post! 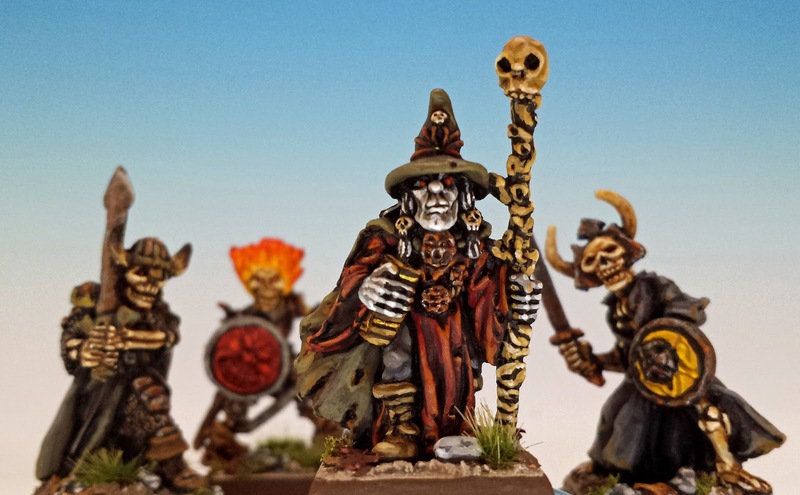 Great write up of a key piece of Oldhammer history! And what a great collection! Heinrich and his boys look great! Can't wait to see more! Thanks Mr. Mouse. I can't wait to write up the rest of the posts for this collection. Thank you, Alain. I'm happy you liked it. Couldn't be more jealous of you for owning that little beauty! Didn't realise he had such a rich history too. It's a great history, isn't it! I actually quite like Kemmler, and hunted one down sometime in the last year. Didn't even know there was a Kemler until more recently, and now he's top of my ebay saved search list. The Kemler figure looks more humble than the Kemmler figure. I think I do like Kemler better, but Kemmler was a signature undead player's figure when I was heavily into warhammer as a kid, so will always hold a special place in my heart. That is definitely the thing about Warhammer -- it's what you grew up with that really pulls on your heart strings. I like the face on the later Kemmler very much -- it's haggard and menacing at the same time. Good luck with Kemler... I hope the eBay gods are kind to you!